You are here: Home / Damp / Which type of ‘moisture meter’ is best for damp diagnosis – a quick and simple appraisal. There is not much that gets people excited in my industry more than the ‘moisture meter’ debate. Any search of the Internet will throw up all manner of strident opinion, often accompanied by some sales pitch or other, based on the writers agenda and current preference. In these cases how do general surveyors and consumers see through to the truth? There is a Building Research Digest called BRE 245 “Rising damp, diagnosis and treatment” which gives guidance to surveyors. However, it is technically beyond most laypeople and unfortunately, I’ve noticed a growing trend to mis-quote it, in support of survey methods which it doesn’t actually validate. This is why I have knocked up this short (ish) post on the pros and cons of the various basic methods, with an easy to follow table outlining the benefits and disadvantages of each. I remind readers that I own all these meters and am trained and experienced in the use of each method. 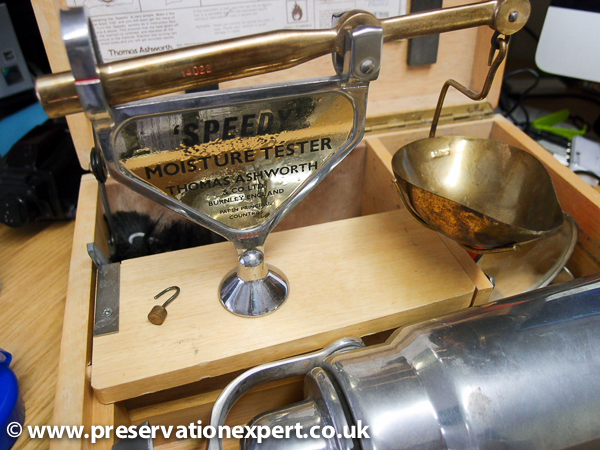 Lets start with the reason why we use moisture meters to test for damp. The goal of any moisture meter use is to try to help a surveyor establish if a wall is damp and if so, why and how it has become that way. No meter will do this on it’s own and here is the crux of the problem. Many people using these methods will have different levels of training and experience; mistakes can and do happen. Meters do not in themselves diagnose a damp problem. However they can be used to discount one. One of my pals in the Property Care Association told me that they should actually be called ‘dry meters’ because of course “If they give a very low reading then that is certain, whereas if a higher reading is given, that is always open to interpretation”. Wise words. There are lots of cases of agenda driven damp diagnosis – contractors, some of which either want to exaggerate a damp problem (because there’s a job in it for them), or where they want to disprove an issue (perhaps because they have done work, which they guarantee and are reluctant to rectify). Whilst this area is well trodden and mature, the changing face of damp proofing and the arrival of the Internet, has spawned a new phenomenon; it’s easy to propagate narrow agendas to a wide and sceptical audience. The Anti damp Specialist Damp Specialists are now joining contractors; misusing moisture meters and misleading consumers with equal enthusiasm. Some of these chaps misuse and abuse moisture meters for a new agenda – as opposed to the old issue of looking for damp-proofing work – some independent (and not so), surveyors try using their chemical moisture meters to either; disprove the presence of dampness to impress consumers and earn a fee (whilst generating more fee paying consumers) or, convince consumers they have a damp problem which a contractor has missed or caused. Clearly the above is not an ideal template for good practice and that is a shame. Misuse by contractors promotes distrust and it costs consumers a fortune in paying for unnecessary work. It also results in destruction of existing fabric, which could be salvaged – it is very wasteful of scarce resources. Unnecessary work never solves the real underlying damp problem, so is in itself a self-perpetuating scar on the industry, leaving clients out of pocket on the one hand – and nursing a damp house on the other. No wonder they are angry and wary of being conned. Abuse/misuse by independent surveyors is equally damaging. Fees for such surveys are high and the results are often no more than a self-serving massage of the client’s ego, with many reports simply decrying previous diagnosis, often mis-using other diagnostic means as justification. This leads to further miss-use and, dampness persisting into the future. The housing market in particular is wide open for this type of abuse – vendors are often wary of contractors and buyers too, so are more than willing to pay for a ‘hired gun’ to confirm their own opinions. They fear someone reducing their asking price, on the say-so of a valuation surveyor or damp-specialist report. Whilst this is great for the independent damp surveyor, the situation is usually an impasse – because the sale stalls and the buyer ends up with a damp house and no guarantees of any resolution. Or the sale falls through because the independent surveyor, for all his crowing and strident self-justification to the vendor, cannot offer buyers a guaranteed solution with the reassurance that brings. Whilst Property Care Association independent damp surveyor members have to carry professional indemnity insurance, to back up their findings, non-members often don’t carry this. Some non-PCA independent damp specialist surveyors are under trained, and lack experience; though that is slowly changing. Some even dispute the existence of rising damp, despite the decades of evidence to the contrary. Steven Fry quoted this myth on QI and the lovable chap is now quoted by some of these surveyors in support of their view. A role model who is a comedian, being cited as purveyor of the gospel truth on damp diagnosis, by a damp specialist? Whatever next? This is the reason for this post – the agenda driven posturing, about the advantages of one type of moisture meter or another, is confusing consumers and surveyors alike. The following sets of how these methods vary and where each has an advantage and a disadvantage. So then, lets compare and contrast the available moisture meters, so we can reach a balanced view. There are two basic methods of measuring the moisture in a wall or in plaster. These are qualitative and quantitative. For now, forget the actual mechanisms for getting the readings and let’s discuss the above – it’s crucial to understand this. Quantitative measurement is specific and exact. By that I mean that this methods gives an accurate measure of the amount of moisture in a sample of plaster or masonry by weight, given as a percentage. Thus if you have a gram of material and it has half it’s weight in water the meter of whatever type will quote that as 50% total moisture content. We’ll look at what these readings actually mean in a moment but the above is it in a nutshell. Qualitative readings are not specific and exact. They are quoted relative and will vary for materials of different densities and conductivity – in addition to the variations resulting from the amount of water present. Sounds a bit iffy for measuring moisture in a wall but read on, and see why this rarely matters. Quantitative meters include the ‘Speedy’ chemical moisture meter and Gravimetric testing methods. 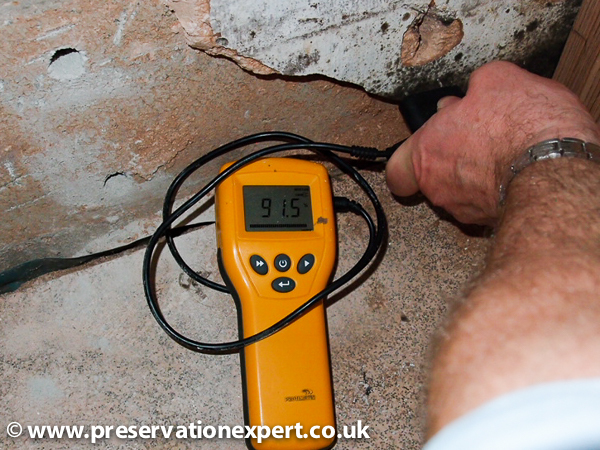 Independent surveyors, consultants and the odd enlightened contractor use these damp diagnosis methods. Qualitative meters include the electronic moisture meters such as radio frequency, resistance/conductivity and capacitance type. Independent surveyors, consultants, all contractors and some homeowners, builders and DIY enthusiasts use them. Quantitative methods require a sample of masonry or plaster to be obtained by drilling or chiseling, to be weighed before testing. This means they are destructive to the decorations and fabric. Qualitative methods are either non-destructive or the damage is confined to pinpricks or, tiny holes for deep probe insertion (more of that later in the moisture meter comparison tables). The above sets out differences, but to sort out the benefits of both these methods, we need to address the goals of the damp survey. 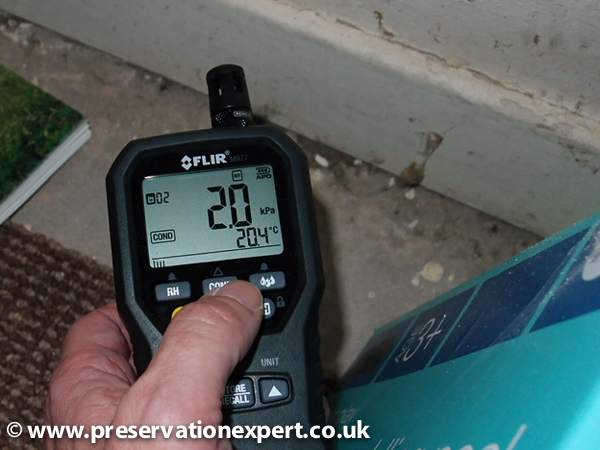 What do we want to know about damp and, how can these moisture meters/method help us? Consider this… how important is it to know the percentage of moisture by weight, of a sample of plaster or masonry? To answer this is impossible as a generalisation, but it’s worth asking – the answer depends on the site and the situation. And the reason for the survey. If for example a sample of plaster has a moisture content of 5% what does this tell you? Not much is the answer. 5%mc in one type of plaster or brick may result in spoiled decorations, decay in structural timber embedded in it, or a build up of salts and an ever increasing problem. Equally, it may be an acceptable %mc and result in none of the above issues. If this sounds daft I am sorry – it’s to do with the moisture carrying capacity of the materials and whether the moisture is static or moving/being refreshed over time. Whether it is evaporating freely also has an influence on outcomes. By the same token, a qualitative (lets call these electronic from here on), meter used on the above sample could give a ‘low’ reading or a ‘moderate’ reading or, a ‘high’ reading. These variations are due to the density and natural conductivity of the material, which can be modified by salts or finishes…. Plus of course the amount of moisture in the wall. I am sorry if this comes as cold comfort – all methods require trained experienced operators and impartial interpretation of the results. You may ask how electronic moisture meters can be subject to anything like sensible interpretation, bearing in mind the above influences? This comes down to several important and essential considerations, effecting the use of all types of moisture meter, not only electronic ones. In every case – the use of ‘one off’ readings from masonry or plaster, in order to make anything other than a guess on cause or severity is highly questionable. Every type of meter requires a moisture profile to assist in diagnosis. This is because the material differences I mention above, ensure that the only way to get an accurate picture, is to find the distribution of the moisture over a wall or within it. It is the distribution and relative differences in the amount (qualitative or quantitative), of moisture and the site-specific visible features, which combine to achieve accurate damp diagnosis. In some cases it is necessary to break this down further still, by separating out the ‘free’ water from that which is absorbed by salts and to see what type of salts are present and importantly… the distribution and concentrations of salt. Profiling for moisture analysis is the only reason a surveyor would use any of the above methods or meters on masonry. Sounds a flat statement doesn’t it? I can back this though because whilst an electronic meter reading or a gravimetric, or chemical reading in isolation on masonry is of little use (unless it is absolutely dry or wet through), a reading from a piece of timber can be used in isolation. If wood is kept well below 20% Wood moisture content (WMC) we need not worry – kept much above 20% or approaching 28% and trouble is brewing. As I’ve said one-off readings are next to useless in masonry and the distribution of moisture is crucial to diagnosis. Thus a profile; taking samples progressively, in the case of rising damp from the bottom up – is mandatory for good diagnosis. This is the stuff used to react with water in a speedy meter and produce highly inflammable acetylene gas. The amount of gas is proportionate to the amount of water in the sample, so a pressure gauge is used to produce the result. The tables below offer a quick guide on the pros and cons of the three main meter type – Chemical meters (speedy), electronic moisture meters and, the gravimetric (oven drying), method to BRE 245. Fast for ‘one off’ readings Very slow for profiling with only consecutive test results – one after the other. Cannot practically be used for BRE 245 diagnosis of multiple samples (too slow). Many reading uses lots of reagent which is expensive, harmful and wasteful. Offers moderate credibility on site Can over-read due to salt contamination and less common causes. Many offer radio frequency or capacitance mode for below surface readings (without damage). This meter can instantly calculate vapour pressure, air temperature, dew point, surface temperature and it can wirelessly link to the authors thermal imaging camera, overlaying real-time data within the thermogram. Reading the above you can see some shared pros and cons. Comparing the tables reveals some obvious differences – only the electronic meters are non-destructive and quick for profiling on site (multiple tests very fast). Only the chemical moisture meter and gravimetric methods offer quantitative results, acceptable for a BRE245 test. This allows us to put the electronic meters on one side – we know what they are best for. Now look at the gravimetric and chemical tables only. Remember the essential requirement of using all meters? This is being able to profile many results to iron out the variable nature of materials and make a diagnosis, based on distribution of moisture through a wall. The chemical meter is very slow, taking about 15 minutes for the first test and probably 12 for each of the following. A profile for say – rising damp will have at least 6 and ideally 8 or 10 samples. If these are needed from plaster and the wall (bed-joint usually), this will double. It follows that obtaining and then consecutively testing the sample will take many hours on site. In the process the samples are destroyed, so further analysis for hygroscopic moisture or salts is not possible (though double size samples can be halved and the untested half subjected to gravimetric testing for hygroscopic moisture and salt testing back in the lab). In addition the chemical meter is exactly that; it involves a chemical reaction on site. 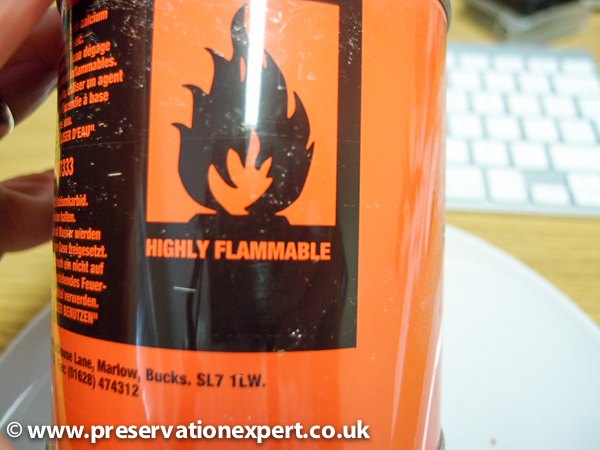 This gives off unpleasant, explosive and harmful acetylene gas. Not too bad for the ‘one-off’ sample (which as mentioned is not worth taking), but after a few tests indoors, throats itch and eyes begin to water – I know this from experience. Forget the calibrations and such because that applies to both quantitative methods. The gravimetric method is also destructive and takes time. 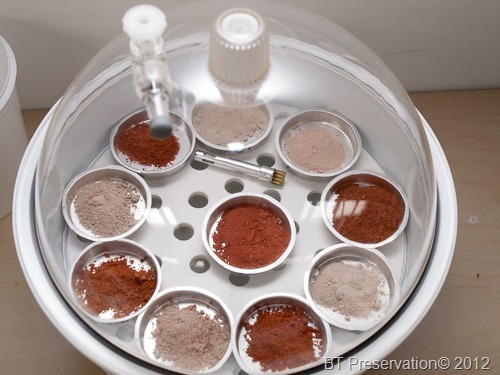 However, the time on site is much shorter because samples can be half the size (they are not destroyed in the process), and testing is done back in the lab with all samples being tested concurrently. This is great because 10, 20 or more samples can be weighed, placed in a humid box and then oven dried. They are not destroyed and can be tested later for salts. The gravimetric method is also the only way a sample can be fully tested to BRE245 – it will allow separation of the free (capillary), moisture from the hygroscopic (salt derived and air dry moisture). Whilst a chemical meter can be used as part of the process, you still need to cut the sample in half on site and save it in an air-tight bottle for the RH75% and oven drying – plus you need a .000g balance. So this separates out the chemical from the pure gravimetric. A chemical can be used but will still require some gravimetric input to work fully with BRE245. This is why many advanced and experienced consultants use gravimetric damp testing methods, rather than a chemical speedy meter. That’s not to say the Speedy has no uses. I use mine occasionally and used to love it, before I took the plunge and trained up on the gravimetric method. So, as a consumer or general surveyor where does this leave us? One phrase in the ‘Cons’ tables of all meters is most important – “Interpretation of the test results requires training and experience”. If you are using any of the meters – you need to use it a lot. Compare results and question them. Be consistent in the methodology so you can compare like with like. Any method based on random and unplanned testing will result in confusion and a bad-learning experience. My advice for consumers and general laypeople is this; Do not be bamboozled by these meters. If someone turns up with any one of them don’t panic. Do watch them and see how they are using them. If a single or couple of samples or tests are done and a diagnosis reached, be very very skeptical. Beware of anyone quoting percentages readings with electronic moisture meters unless they qualify it with the term “Wood Moisture Equivalent’. Also be wary of independent surveyors charging a fee for a ‘carbide or speedy test’, which involves a single or couple of tests, followed by a grand statement like “It’s sopping wet’ or ‘dry as a bone’ without the full profile to back this up. To do otherwise is ludicrous. Recently I’ve seen some comparing the readings from one type of meter against another in different materials. Ostensibly to support the use of a carbide meter over electronic moisture meters. This beggars belief and reveals a gross misunderstanding of how these meters work (or pre-determined cynicism in reporting these readings to clients as some sort of validation one way or another). Placing an electronic moisture meter in say, plaster on a wall and getting a high reading, followed by comparing the reading obtained from brickwork behind the plaster, using a chemical moisture meter is crazy. Comparing different moisture meter types is useful only when testing the same sample. For example, if you wanted to compare two separate bits of measuring equipment, such as a pair of contact lenses against a pair of designer spectacles, how would you do it? You wouldn’t try on the glasses in a well lit room and then, compare this view with that which you achieved, wearing the contact lenses outside on a pitch-black night would you? Of course not – the situation really is black and white and you’d have no idea which gave you the best vision, even though you could see better indoors than out. Which moisture meter is best for my damp old house? The miss-use of electronic moisture meters has unfortunately spawned a backlash of poorly trained and self-taught independent damp specialists, who use chemical moisture meters, in effect as a ‘bamboozle meter’ (Thanks to my mate Peter Macdonald for this gem). This is the same technique some of the more aggressive damp contractors used to use when electronic moisture meters were the new big thing. The truth is that some contractors are after your money and the electronic meter helps them get that. Some independents are also after your money and the chemical moisture meter helps them do that too. Those who use a single ‘high’ electronic moisture meter reading to recommend a damp course and those who use a ‘low’ chemical speedy meter reading to make the opposite case, using only one or two readings, are opposing sides of the same counterfeit coin on my view. 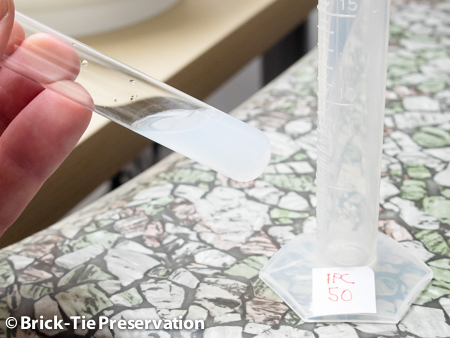 Earlier in this article I asked “How important is it to know the percentage of moisture by weight, of a sample of plaster or masonry?” The answer is that it is only important if you are separating out hygroscopic moisture content in accordance with BRE 245. If you are not doing this then the total moisture content, reached using a carbide meter only, can often mislead. Is the gauge reading on your speedy the result of salt damp, capillary water or a combination of the two? The answers to these are either irrelevant (in many cases this is so), or they matter – in which case BRE 245 must be followed in full. (edited – 2015… since writing this I have experienced many more gravimetric profiles and found as high as 8% HMC in a wall with virtually no capillary water in it – this is significant dampness caused entirely by accumulated hygroscopic salts, following problems in a chimney, where the client wanted to sue the roofer for a leak which was fixed – HMC separation proved that it was a plastering issue and the roof was no longer leaking). Please remember – most people in business are like you and me and they are honest and hard working. Pre-judging the chap because he has one type of meter or another (or in my case all of them), is unfair and unnecessary. However, do watch how things are done – ask questions. Follow the methodology and think… are his/her findings sound, based on what you’ve seen and heard? My opinion is that all these moisture meters are useful and have their place. It’s the operator which really matters. However, with all my survey toys to hand I am spoiled for choice, so if I had to make do with one of them, which would it be? That is a no-brainer. The electronic moisture meter is the most flexible, fast, non-destructive and cheap way to help diagnose the majority of dampness issues. The other two meters would be missed; I’d probably have to take the odd risk, when deciding if a wall had remained damp due to a mis-diagnosis or failed intervention, or a simple salt contamination issue. However, these cases are quire rare provided an open mind and thorough inspection is carried out. Don’t believe me? I asked the most experienced and reputable independent damp consultant I know for his view. Graham Coleman told me “My lab books go back years and are full of gravimetric profiles with salt analysis too – the number of times the gravimetric method has disagreed with a rising damp diagnosis; based on proper use of an electronic moisture meter are fewer than the fingers of one hand – its very rare”. 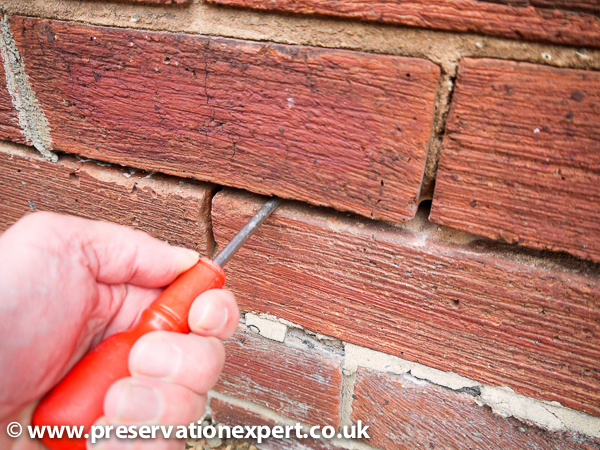 For those needing advanced damp diagnosis skills in Yorkshire, you can consider checking out my company Brick-Tie Preservation web site’s damp consultancy page or, call my office via the numbers on there. I hope all is well with you and yours. It is a bit long and will only ever be read by damp diagnosis nerds…. like you lol. It could be shorter but I wanted to set the background to as I am seeing some quite disgraceful diagnosis being published on the back of one or two carbide meter tests. Of course this happens every day via electronic moisture meter users too, but two wrongs don’t make a right. Why people don’t profile their readings properly is a mystery to me. You are exactly right that to “find” a true problem, multiple areas need to be measured and compared. This cannot reasonably be done with the destructive tests (Chemical – like Speedy, Heat – Loss on Drying moisture balances). In the case of the building, renovation, remediation, and problem determination issue – a portable, instant, portable analyzer is needed. The key is to find one that is both precise (repeatable) and durable. If we can help, please see below. Great article Bryan – and great CPD reading for RICS Surveyors like myself who appreciate sound technical articles from specialists like yourself. However, now I am a practicing RICS surveyor, my only tool for dampness is the good old moisture meter and I agree 100%. In the right hands it has to be the best tool as long as you accept it is non destructive and therefore requires experience to take a view on its results and limitations, if that makes sense. In many situations there will be an obvious reason the meter is giving you a high reading, and after following the trail,experience will hopefully help the surveyor diagnose what the cause is. I agree completely and I’m delighted you found the article useful. Keep up the good work and do get in touch if I can help at all. I’ve a 1904 house with some damp problems and over the years have had a few “damp specialists”, all “qualified” and in my view all rubbish. 2. Do chemical DPCs actually work? 3. My house is on sloping land and there is no doubt the most “damp” problems are where the ground level is nearest the existing dpc. I can also see that where the original dpc is missing (for example small parts of chimney breasts) I have noticeable but small damp patches. Would removing the earth adjacent to to the walls down to the footings help? Excellent explanations. I am about to undertake surveys on suspect retro-Cavity Wall fills. It is a 16 point script (fill in the blanks with ticks and meaningful word descriptions) to be completed for each property. I have yet to discover the ‘real motive’ of the company behind this initiative but I hope too sooner rather than later. I qualified as a Home Inspector (HI) in 2010 though in Preston there was no work for Home Condition Reports (HCRs). However it was an educating refresher to read your article and recognise terminology words from my old training days. This article has to be useful for multiple experience surveyors meeting the damp meter challenge. I’m glad you found the post useful. Good luck in 2018.